It is a spectacular demonstration of the capabilities of human engineering. 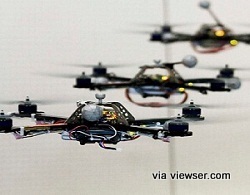 Linked Nano Quadrotor Drones fly in unbelievable choreography. How long until we combine the two – and make flying robots that do this? And when we birth those drones, will they feel what they have been programmed to sense? Will they be able to choose their own destiny? Who and how will they serve?